The full chapter can be accessed using the link on the right. This introduction discusses recent developments in the Israeli education system. 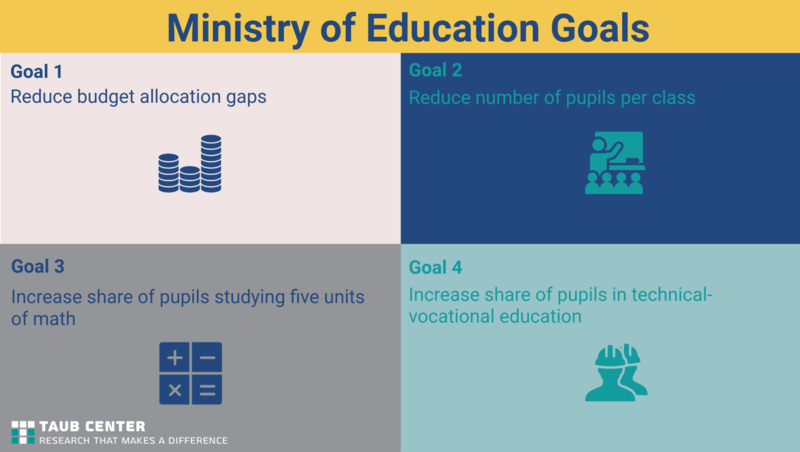 In the Explanatory Notes to the Budget, the last two Ministers of Education identified and emphasized the same goals: (1) reduce gaps in budget allocations between different socioeconomic strata and population sectors; (2) reduce the average number of pupils per class; (3) increase the percentage of pupils studying high-level mathematics (five units); (4) increase the number of pupils in technical-vocational education and their share out of all pupils in secondary education. While the combined Haredi and Arab Israeli share of the education system rose from 15% to almost 50% between 1960 and 2000, and continued to rise between 2000 and 2010, the situation changed between 2010 and 2016: growth in the number of Arab Israeli first graders ceased and even became negative, while in the Haredi sector, growth declined, and is now no greater than that of the other Jewish population groups. From 2000-2016 the Ministry of Education budget increased by 86% in real terms. The number of employed teaching personnel grew by 55% and the number of classes by 34%, while the number of pupils in the schools increased by only 30%. Expenditure per pupil increased throughout the education system, but mainly for the stronger socioeconomic classes (the upper quintiles). Between 2013/14 and 2015/16, NIS 878 million were added to the total budget for official primary education, of which only NIS 215 million (24%) were added for pupils in the two lowest Nurture Index quintiles. 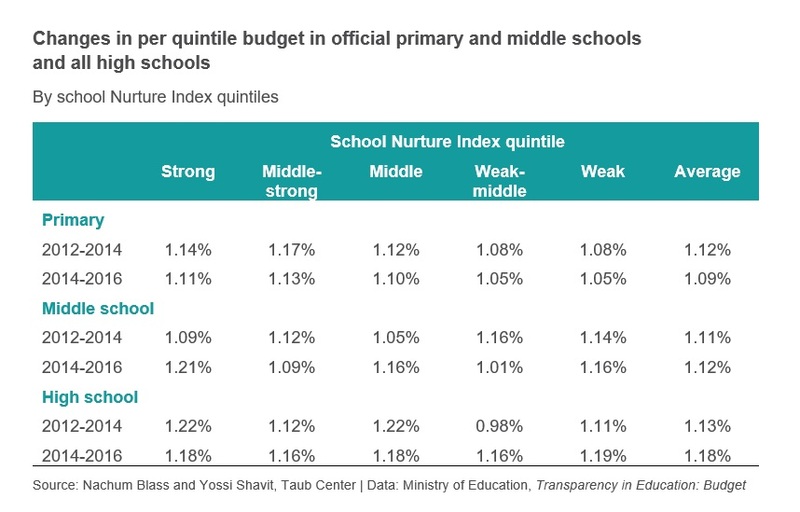 The total addition for middle schools was NIS 600 million, of which NIS 172 million (29%) were for the two lowest quintiles. In terms of teaching hours per pupil, schools in Jewish primary education in the lowest quintile experienced only minor changes in budget (an increase of about 2%), while in the lower quintiles of Arab Israeli primary schools, there was an increase of 3-5% on average. However, the number of hours per pupil in Arab Israeli education in all quintiles is still much lower than the number of hours per pupil in the Jewish sector. Results of efforts to reduce the number of students per class were primarily evident in the Arab education stream, where classes had previously been very large. A very small change in class size occurred in the Jewish sector, mostly concentrated in the well-off quintiles. Between 2014 and 2016, the share of pupils eligible for bagrut with five units of math rose from 9.5% to 11.4% of all bagrut exam takers. However, this may be due in part to changes in the demographic composition of Israel’s twelfth grade population. Since 2010, the share of post-secondary pupils in technical-vocational education has risen to 35% in the Jewish sector (from to 32% in 2010) and to 43% in the Arab Israeli sector (from 40% in 2010), for a total of 37.4% in 2016.